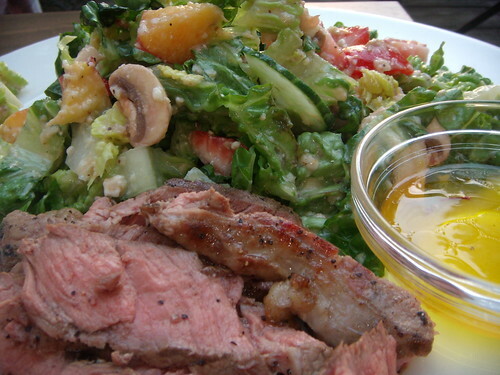 tender grilled lamb leg with mint and saffron sauce and citrus salad, originally uploaded by aarn! +16th July, 2008+. grilled a steak of lamb leg basting it with olive oil, salt, and pepper, sliced it up and served with a simple syrup and white balsamic sauce infused with fresh chopped mint and saffron (let it chill out in the fridge for about 24hrs). salad was romaine hearts (as usual), cucumber, tomato, mushrooms, peaches, strawberries, and blue cheese. the dressing was a vinaigrette of apricot juice, seasoned rice vinegar, fresh garlic, greek yogurt, and canola oil, with some panko breadcrumbs and grated romano for texture/thickening.